Two years ago I read in an article that Denmark will be “Down syndrome free” by the year 2030. Not because of any great scientific breakthrough either, only through eugenics. traits in order to purify the human race. It was a kick to the gut. 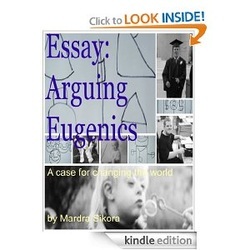 This essay, "Arguing Eugenics: A case for changing the world" is my response. It argues the case for children considered to be imperfect. Filled with facts about Down syndrome, quotes from specialists, and personal anecdotes, this quick read will leave you with a clearer picture of the power of potential. eugenics possible or stop its progression. embrace and celebrate this unexpected event. the gifts all children bring to the world.